The Product is Very Inexpensive and Can Be Purchased From Carolina Biological Supply CLICK HERE! pH is important for Biological Processes. In liquid water, a small percentage of the water molecules dissociate or break apart into hydrogen ions (H+) and hydroxide ions (OH-). These ions are very reactive, and changes in their concentrations can drastically affect a cell’s proteins and other complex molecules. Some chemical compounds contribute additional H+ to an aqueous solution, whereas others remove H+ from it. A substance that donates hydrogen ions to solutions is called an acid. An example of a strong acid is hydrochloric acid (HCl), the acid in the gastric juice in your stomach. An acidic solution has a higher concentration of H+ than OH-. We use the pH scale to describe how acidic or basic a solution is (pH stands for potential of hydrogen). Each pH unit represents a 10-fold change in the concentration of H+ in a solution. For example, lemon juice at pH 2 has 10 times more H+ than an equal amount of a cola at pH 3 and 100 times more H+ than tomato juice at pH 4. #2 Neutron(s) - Are also in the nucleus of the atom, but they do not have any charge. Atoms all have a nucleus. This is where the Protons and Neutrons (if any) live. It will be helpful to know WHERE the element is on the periodic table! This will give you a clue on how it will bind! Atoms bind using their outer-most electrons 98% of all living organisms are made of C (carbon) H (Hydrogen) N (Nitrogen) and O (Oxygen). In the human body, we have CARBON 18% / OXYGEN 65% / HYDROGEN 10% / 3% NITROGEN Carbon is the most important biological molecule for life as we know it! Carbon is the central element of life. ONLY Carbon has the ABILITY TO Create up to 4 bonds that are ALSO extremely strong. This allows for complex molecules to form - Carbon can bind up to 4 other atoms! Life on other planets would most likely be CARBON-BASED as well. We Must Also Look For Water, since water is necessary for life on Earth. Carbon and Water seem to create LIFE under the right conditions. Water allows for Chemistry to happen. "FOLLOW THE WATER!" IS NASA'S MOTO FOR THE SEARCH FOR EXTRATERRESTRIAL LIFE! WHY? NOW LET'S FIND OUT! Why do we need to find water to find life? Water is in LIQUID form here on Earth. Water is considered a POLAR molecule Since it is slightly negative on one end, and slightly positive on the other end! The Polarity of water allows it to have the ability to dissolving a variety of different substances! This is why water is called the UNIVERSAL SOLVENT. Water can dissolve more substances than any other molecule! What is it about cabbage that causes this to happen? Red cabbage contains a water-soluble pigment called anthocyanin that changes color when it is mixed with an acid or a base. The pigment turns red in acidic environments with a pH less than 7 and the pigment turns bluish-green in alkaline (basic) environments with a pH greater than 7. Red cabbage is just one of many indicators that are available to scientists. Some indicators start out colorless and turn blue or pink, for example, when they mix with a base. If there is no color change at all, the substance that you are testing is probably neutral, just like water. Students are introduced to the concept of acids and bases. 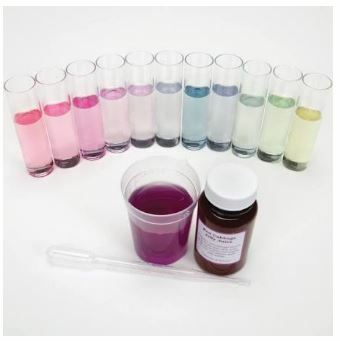 Using a disposable pipette, add 1ml of red cabbage concentrate to each test cup or tube. Fill a large beaker with Distilled water and bring it back to your desk. Use your disposable pipette to transfer some Distilled water from your beaker to the graduated cylinder, until you reach the 20 ml graduated mark on your graduated cylinder. Pour the 20 ml of Distilled Water from your graduated cylinder to one of your test cups or tubes. Repeat steps 3 and 4 until all of your test cups or tubes have been filled. Carefully add a few drops of HCl (hydrochloric acid) to #1. Enter the relevant data into your TABLE I. Carefully add a few drops of aspirin dissolved in water to #2. Enter the relevant data into your TABLE I. Carefully add a few drops of clear soda to #3. Enter the relevant data into your TABLE I. Carefully add nothing to #4. 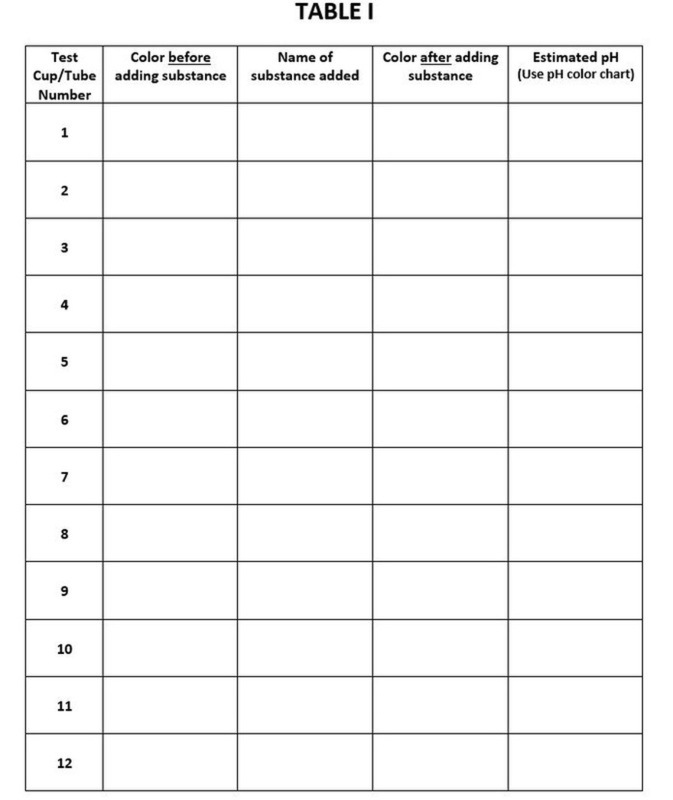 Enter the relevant data into your TABLE I. Carefully add a few drops baking soda to #5. Enter the relevant data into your TABLE I. Carefully add a few drops of distilled water from your beaker to #6. Enter the relevant data into your TABLE I. Carefully add a few drops of TAP water from the sink to #7. Enter the relevant data into your TABLE I. Carefully add a few drops of soap to #8. Enter the relevant data into your TABLE I. Carefully add a few drops of cooking oil to #8. Enter the relevant data into your TABLE I. Carefully add a few drops of vinegar to #9. Enter the relevant data into your TABLE I. Carefully add a few drops of sodium hydroxide to #10. Enter the relevant data into your TABLE I. Carefully add a few drops of lemon juice to #11. Enter the relevant data into your TABLE I. Carefully add a few drops of apple juice to #12. Enter the relevant data into your TABLE I. Answer the questions and list any other observations! The substance in red cabbage that changes color with changing pH values is called _________? Why do you think the water sources were or were not the same color?